You’ve seen her photo, but how much do you know about Eleanor Putzki? 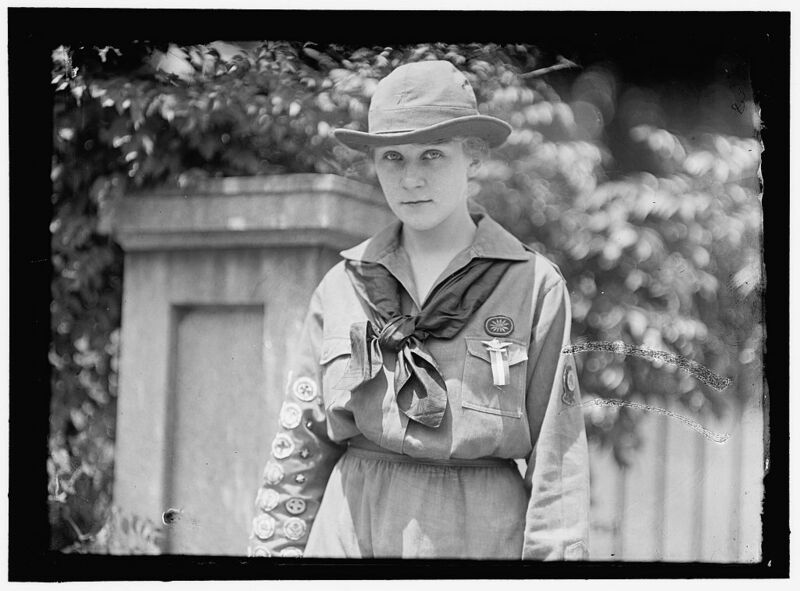 Eleanor Putzki was an original member of Washington, DC, Troop 1. Formed in late 1913, the troop met at Wilson Normal school and was led by Mrs. Giles Scott Rafter, a leader in the PTA movement and vigorous advocate of education for girls and statehood for the District of Columbia. Eleanor was an outstanding Girl Scout, whose accomplishments were regularly mentioned in newspaper reports about the young movement. At the October 9, 1915, all-troop hike, for example, Eleanor was praised for correctly identifying 25 varieties of wildflowers. She received her Red Cross badge from none other than Juliette Gordon Low herself in January 1916. In May 1916 she was asked to “display her assortment of proficiency badges and explain what they meant” for other troops. She had to impress an unusually well qualified board of examiners to receive those badges. She was quizzed by Professor Wells Cook of the US Department of Agriculture and experts at the Smithsonian Institution and Department of the Interior. Her nursing exam was administered by the head of the Visiting Nurse Association, while Fred Reed, the first Eagle Scout in Washington, assessed her mastery of the material for her pathfinder and pioneer badges. Eleanor was awarded the Golden Eagle of Merit from Mrs. Woodrow Wilson at a ceremony at the White House on June 21, 1917. She was the first Washingtonian to receive the award and the fifth nationwide. The award was the highest available from 1916 to 1919 and required earning 14 proficiency badges; Eleanor earned 25. Fewer than 50 Golden Eagles of Merit were presented before the honor was revised and renamed the Golden Eaglet. Why, no one will ever know what the Girl Scout work has done for me. Only three months ago, when I started after my badge for pathfinder, I scarcely knew the difference between northwest and southeast Washington. To win that badge I had to know all the public buildings, schools, streets, and avenues, monuments, parks, circles, playgrounds and, in fact, be qualified as a guide. Going after Girl Scout badges just woke me up. It makes you see things, and see why and to want to do things better and to help others. At the age of 17, Eleanor was given her own troop at Webster School. The troop grew from seven girls to 34 in just three weeks; and after two weeks’ training 18 of of the girls were rated proficient in first aid and wigwagging (semaphore). Outdoor life is the best thing in the world for girls and I want to encourage every other girl all I can to get out in the open with ears open and eyes open and with lungs open. That’s why I’m going to make my troop of girls the best in the city. I’m going to have every one of them a first-class scout before I’m through. Born on August 5, 1899, Eleanor was the daughter of Kate Stirling Putzki and the artist Paul Putzki, best known for his china paintings. Eleanor married Freeman Pulsifer Davis and moved to Indianapolis. I’ve located little information about her life in Indiana, aside from a handful of clipping that suggest she was an avid golfer. I hope she remained an avid Girl Scout, as well. This entry was posted in Badges, First Ladies, Highest Awards and tagged Edith Wilson, Eleanor Putzki, first ladies, Girl Scout Council of the Nation's Capital, Girl Scout history, Girl Scout memorabilia, Golden Eagle of Merit, Golden Eaglet, GSCNC, GSUSA, Mrs. Woodrow Wilson, museums archives. Bookmark the permalink. ← We Have Access to Collective Access! !